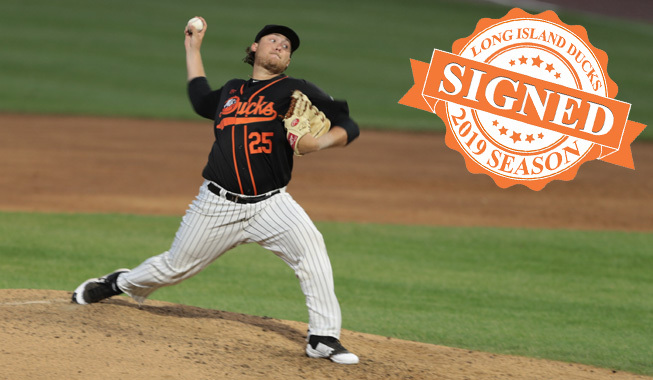 (Central Islip, N.Y., Feb. 12, 2019) – The Long Island Ducks today announced the signing of right-handed pitcher Tyler Badamo. He begins his second season with Long Island, third in the Atlantic League and sixth in professional baseball. Badamo split time in the Atlantic League during the 2018 season with the Ducks, New Britain Bees and Sugar Land Skeeters. The righty combined to post a 5-6 record with a 4.12 ERA, 53 strikeouts and 20 walks in 83 innings of work over 16 appearances (15 starts). Seven of those starts came with Long Island, where he went 3-2 with a 3.38 ERA and 26 strikeouts to eight walks over 40 innings. The 26-year-old yielded three earned runs or less in six of his seven starts with the Ducks and in 10 of his final 12 appearances of the year. The Mount Sinai native made his ALPB debut with the Bridgeport Bluefish in 2017. He compiled a 4-3 record with a 2.63 ERA in 11 starts and had his contract purchased by the Arizona Diamondbacks that June. The Mount Sinai High School and Dowling College alum went on to make 12 starts across five different levels in the Diamondbacks organization to finish the year. Previously, he spent three seasons in the New York Mets system, accruing a 9-10 record with a 3.22 ERA and 141 strikeouts over 37 games (31 starts). Badamo was originally drafted by the Mets in the 24th round of the 2014 amateur draft.